0 Comments Posted by islandtreesadmin in Pet Health on Thursday, October 6th, 2016. When witches, princesses and superheroes take to the streets in search of treats this Halloween, they’ll have some furry friends by their side. According to a survey by the National Retail Federation, total spending for Halloween is expected to reach $8.4 billion this year, an all-time high since the survey began 11 years. With nearly 171 million Americans celebrating Halloween, it’s estimated 16 percent of households will not only pick out costumes for themselves, but for their pets as well. Superheroes and mermaids are the top choices for pet costumes, with bees, sharks and Stars Wars-themed garb rounding out the list. If you plan on letting your pet don a devilish disguise, there are a few safety tips to keep in mind. First, make sure your pet wants to wear a costume. While some animals may not mind being outfitted with a pumpkin suit, others may experience extreme discomfort and stress while in costume. Try putting the costume on your pet in advance of the big night to make sure he or she is comfortable with the idea. And while your pet is out trick-or-treating, don’t forget about the pets that may be coming to your house – keep a few dog treats by the door to hand out to any four-legged companions accompanying trick-or-treaters. Whether your pet is dressed like a spider or a dinosaur, make sure the costume allows for easy movement and is not restrictive or confining. However, also be on guard for costumes that drag on the ground. These costumes can get caught in doors or snag on other objects. If your pet’s costume includes a mask, modify the eye holes so they are big enough to accommodate your pet’s peripheral vision. A pet that can’t see may experience increased stress and could become aggressive as a result. When the trick-or-treating is over and the treats are ready to be had, be sure to keep chocolate away from your dog. Any amount of chocolate is harmful to your pet, so keep the treats out of their paws, no matter how much they beg. Those cellophane and foil wrappers left behind after the treats are gone are also a potential health hazard for your pet. The wrappers can be caught in your pet’s digestive track and cause illness, severe discomfort and even death if the problem is left untreated. • Jack o’lanterns and lit candles may look spooky, but they can pose problems for your pet. Rambunctious pets can knock lit pumpkins over and start fires, and wagging tails can easily get burned by open flames. Keep lit pumpkins and candles up on a high shelf to avoid accidents. • If you’re hosting a Halloween party, keep your pet in a separate room, away from all the hustle and bustle. Too many strangers in odd costumes may cause your pet stress. This will also prevent your pet from sneaking out through an open door and darting out into the night. • Keep your pet indoors during the days and nights around Halloween. Pranksters and vandals have teased, injured, stolen and, in rare cases, killed pets on Halloween. Keeping your pet inside will keep them from becoming a target. 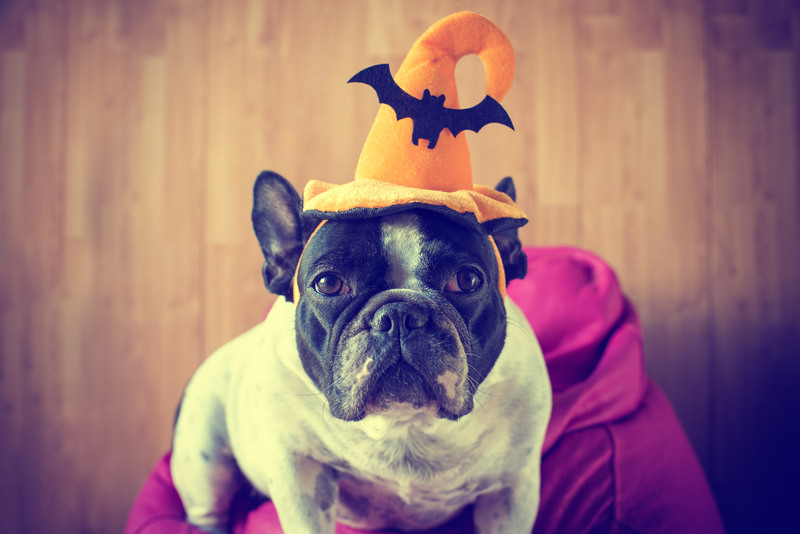 • With all the Halloween festivities, it’s a great idea to make sure your pet has proper identification if they escape from your house or become lost while out trick-or-treating. Halloween can be a fun time for you and your pet. Following the above safety tips will make sure the only scares you experience are all in good fun.